8 in 3 Kits can be assembled machine 8 different functions,(Sawing, Wood Turning Lathe, Lathes, Milling Machines, Drilling Machines, Grinding Machines, Hand Tools, Dividing Drilling), you can only use Three of the eight functions of the machine at the same time. 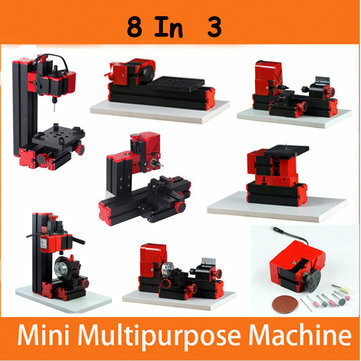 The Mini Metal Lathe is a tool for DIY,hobby,model making,crafts,small parts processing,ect, not the industry CNC product. Recommended types of wood Lim wood, birch, maple, pear tree, cherry tree (medium hard), beech tree, oak (hard). Scope 1, Can process integrated circuit, acrylics, wood, plastic, gold, silver, copper, steel, aluminum, and so on. 8) Can process hard wood strips (beech-tree, nut-tree), wooden bars (max. 20mm diameter)or plastic and soft metal. 2)The input voltage/current/ power: 12VDC/2A/24W. 3)Pransformer has overcurrent, overvoltage, overheating protection. 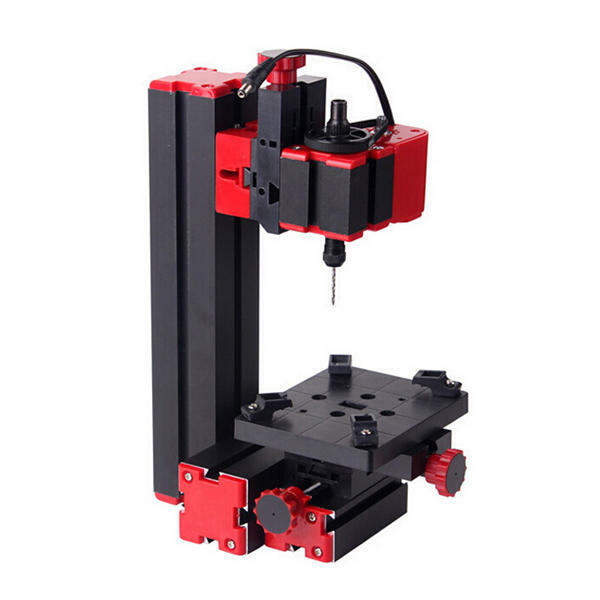 1, the machine's major components: such as the headstock, tailstock, dock, slider, connecting blocks and so all-metal structure. 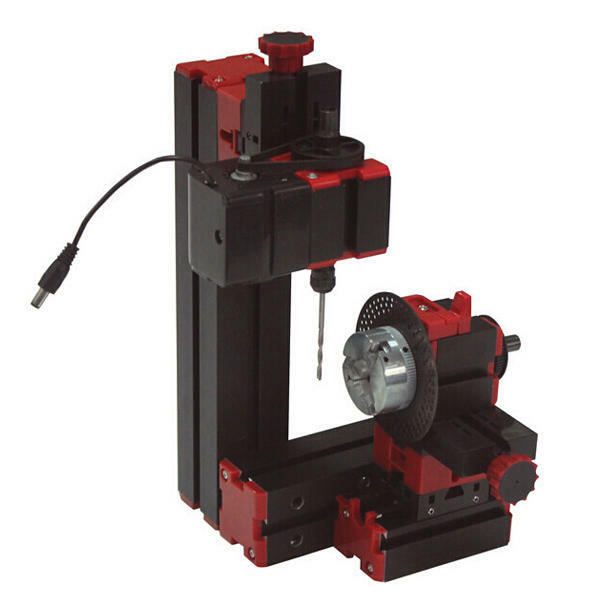 2, with the use of indexing plate, you can round workpiece decile drilling. 3, sub-dial has three circumferentially equal distribution holes, respectively 36,40,48 holes can be selected according to the actual needs of groups of indexing holes. 4, the connection block using two dovetail connection block, solid and stable. 2)The input voltage /current/ power: 12VDC/2A/24W. 3)Processing materials: wood, plastic, soft metals (aluminum, copper, etc.). 4)Three-jaw chuck to clamp the workpiece maximum diameter of 50mm. 5)The transformer has overcurrent, overvoltage, overheating protection. Q: What is the mini-machine? What can it do? 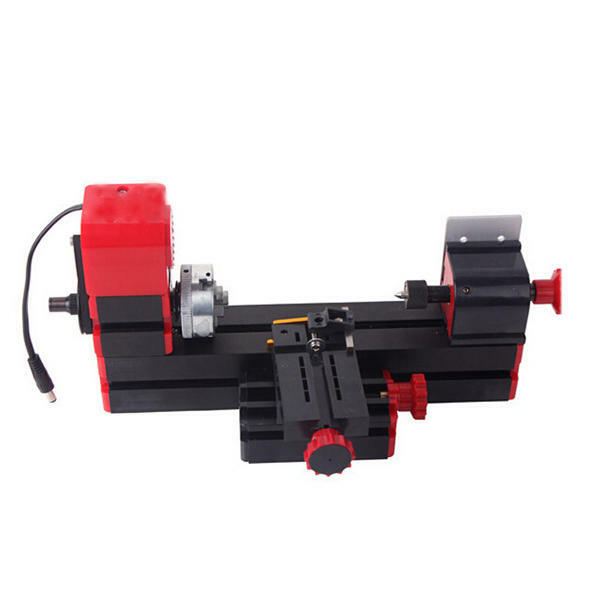 A: It is a delicate combination of processing units, suitable for making models or samples, technical education, product creation and invention, DIY and so on. Q:What functions do Mini-machine have? A:1,Jigsaw 2,grinder 3,Driller 4,wood lathe 5,metal lathe 6,Miller 7,Handheld machine 8,Dividing drilling. Q: What power supply does mini machine use? A: covert from 110-240V DC power to DC14.5V. Q: What is mini-machine made of? A: base is made of advanced aluminum alloy, and it`s durable and not deformed, and other shell parts are made of PC plastic, some chucks are made of metal or copper. Q: How long is the life? A: Ten years will not be damaged under normal use. Q: Can it process metal materials ? A: All the soft metal materials can be processed, such as gold, silver,copper, aluminum etc. In addition, such as acrylic, circuit boards also can be processed. Q: Is this mini machine heavy and big? A: The maximum length is 30CM, package weight is 4.5 kg. Q: Does this machine have the age limit requirement? A: Our customers are from 6-76 years old. Q: how long could the machine be used continuously? A: In theory DC motor can be used continuously for 300 hours,but it is recommended to shutdown to save power and increase the frequency of use or life when you don`t operate it. Q: What`s the minimum hole which you can drill with the drilling? A: Standard is 0.5mm hole. 0.4mm or 0.3mm hole is OK but you need to buy special accessories. Q: How thick material can you choose for the sawing? Q: Which parts are the consumed ones? A: 1, belt 2, turning tool 3, drill 4, Mills 5, saw blade6, saw drive box 7,screw 8, motor fan. Q: Is sawing machine safe?Does it injure the hand? A: absolutely safe, even if you accidentally touch the saw blade, the hand will be safe. Q: Why Sawing not injure the hand? A: Because there is special-stroke design, stroke is only 3mm,it can saw off the hard objects, but the hand is soft and flexible, it will absorb the stroke, so it does not hurt the hand.